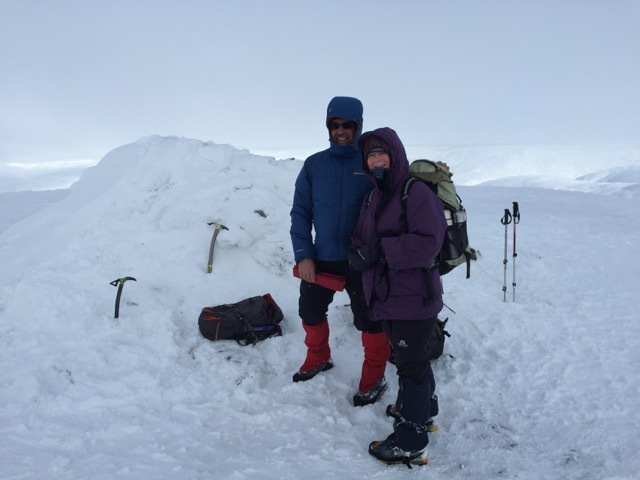 50th Munro – A Scottish Mountain day. We were heading to Scotland to hopefully tick off a few more Munro’s. A Munro is a mountain in Scotland over 3,000 feet or 914 metres and there are quite alot of them. 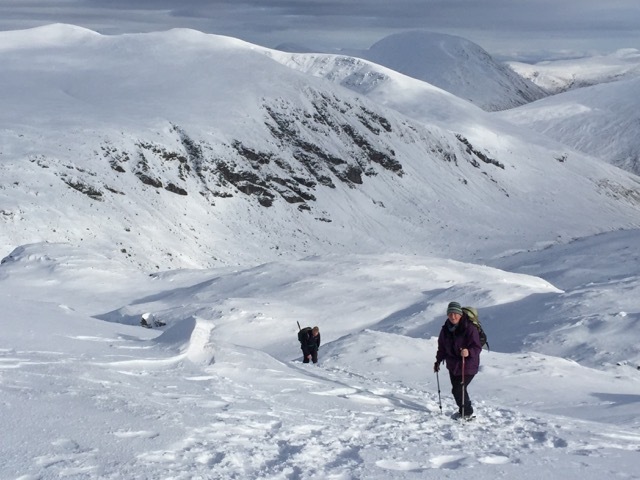 As usual when we head to Scotland there seemed to be a degree of uncertainty about the weather in the week ahead, apart from Monday, where there was a high degree of confidence for dreadful conditions. Plans were changed and aspirations modified but we settled for an early start on Ben Challum (Beinn Challuim) a solitary Munro to the north of the Crianlarich to Tyndrum road. By 08.40 we had parked the car and were heading up the mountain, in surprisingly dry conditions. As we knew only too well, this wasn’t going to last. Although we have always used paper maps and continue to carry a variety of superb maps produced by the Ordnance Survey and Harvey this was the first time that I had used the Viewranger App on my phone in the mountains, I had used it before in coastal environments so was aware of its potential. The cloud base dropped and the rain increased as we made our way up the ridge, initially to Ben Challum South Top, a Munro top before continuing to the main summit. Visibility was pretty restricted so we saw absolutely nothing from the top. The descent was clearly quicker but quite entertaining. The rocks were very greasy, requiring care but even with the extra stability of our walking poles we both hit the ground on a couple of occasions. There was so much water running down the hillside that possibly our best preparation would have been a couple of hours on a stand up paddle board, to improve our balance on moving water. On the mountain we didn’t see another person but amazingly in the couple of hundred metres back to the car with coincided with the West Highland Way we saw 18 other walkers. We had completed our day but were aware that many of them still had some distance to go in what was becoming heavy and persistent rain. It will be interesting to see how these compare to our future walks in the coming months. 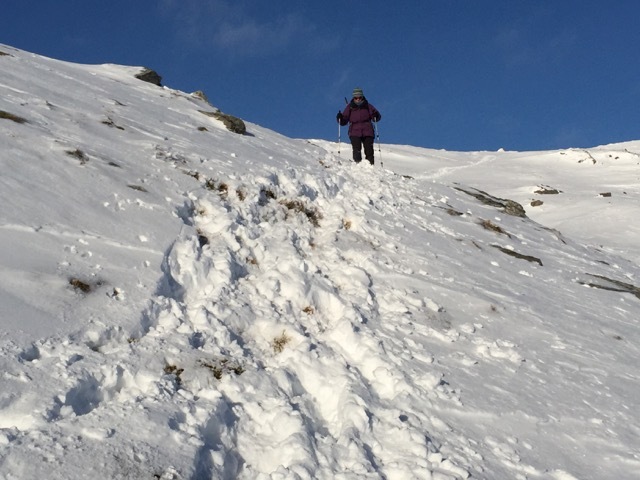 Nicky starting up the path on the northern side of Ben Challum. Clouds are starting to drop. Crossing the deer fence. I can’t remember seeing another sideways stile. For quite a lot of the ascent the path follows the line of a fence. Making navigation fairly straightforward. Me on the south summit of Ben Challum. The rain had really set in. Taken with ViewRanger app. The Skyline feature names the geographical features which are within the field of view. Unfortunately it doesn’t take weather conditions into account because we couldn’t see anything. Nicky descending from the south summit of Ben Challum. On the way up this had just been a gentle stream The water was rising rapidly. Crossing the bridge across the River Fillan on our return. On the way out shingle banks had been visible but the rising waters had covered them. It is obvious that some mountains are more interesting and/or challenging than others and at times the write up they receive in guide books is less than complementary. Ben Chonzie is one of the mountains which falls into this category. We decided to ignore the written cautions, believing that any mountain in full winter conditions has to be interesting. As we drove up the narrow Glen Lednock a red kite flew up in from of us, surely a positive omen. Other people had clearly had the same idea as the small car park was virtually full. The initial route followed a well defined track which gradually disappeared under a covering of snow. The snow was largely unconsolidated as we floundered our way uphill. 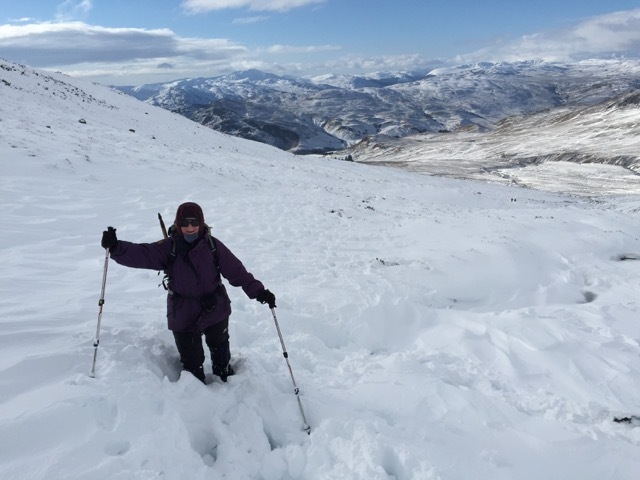 The thought of breaking a trail through the snow without the benefit of walking poles didn’t bear thinking about. Ben Chonzie is the highest point in a large area of moorland and reputed to have a healthy population of mountain hares, although we didn’t see any on our day on the mountain. 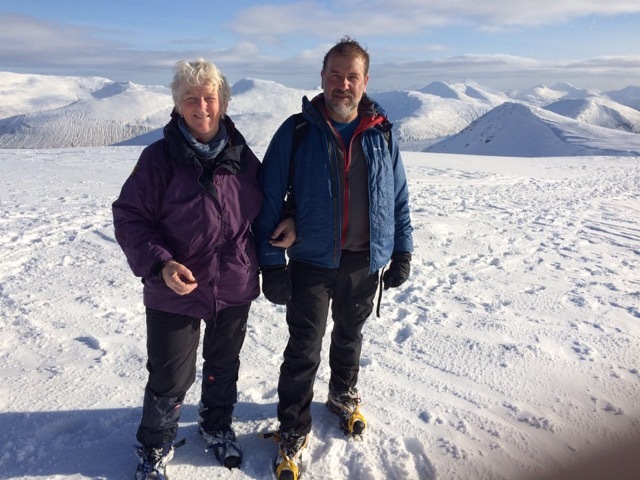 Cameron McNeish, in his book on “The Munros”, states that it has “…. 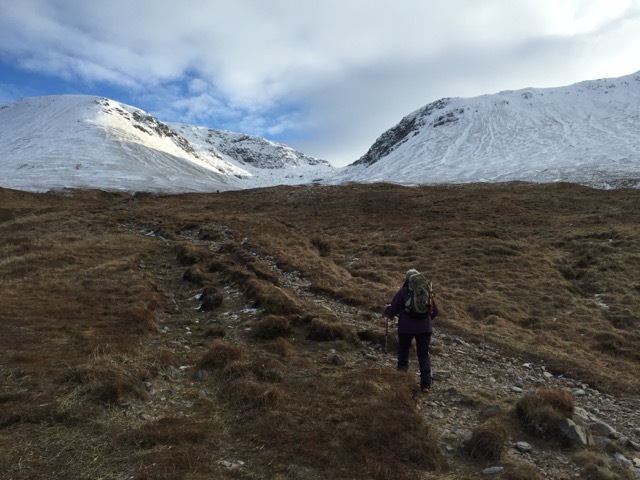 a reputation of being one of the dullest Munros in the land”. 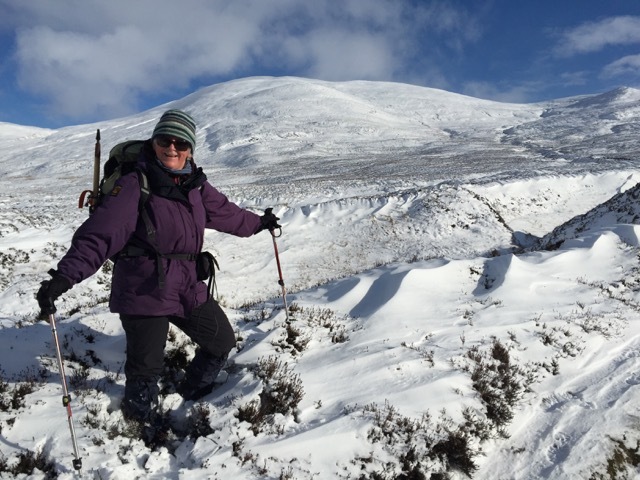 It is easy to imagine that in the summer the long walk in along the land rover track wouldn’t be the most interesting way to spend a day in the mountains but on a bright winters day, with the snow down low, then Ben Chonzie (the 250th highest Munro) is a hill well worth considering. 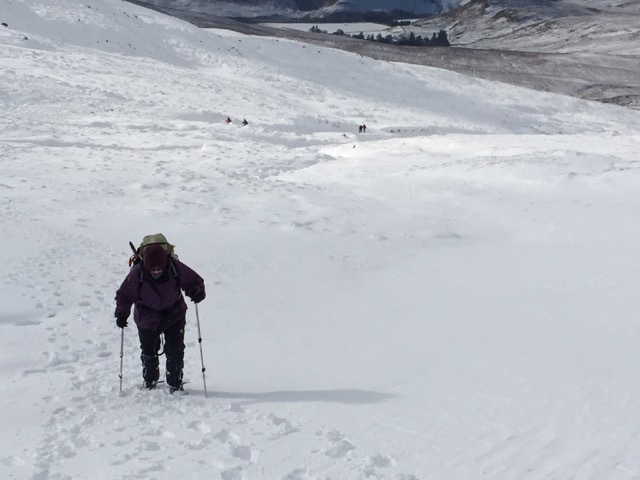 Cutting a track through the deeper snow, our route had followed the line of the valley , which is discernible behind Nicky. Heading up the slopes, using previous footsteps was no guarantee that you wouldn’t fall through to your waist. 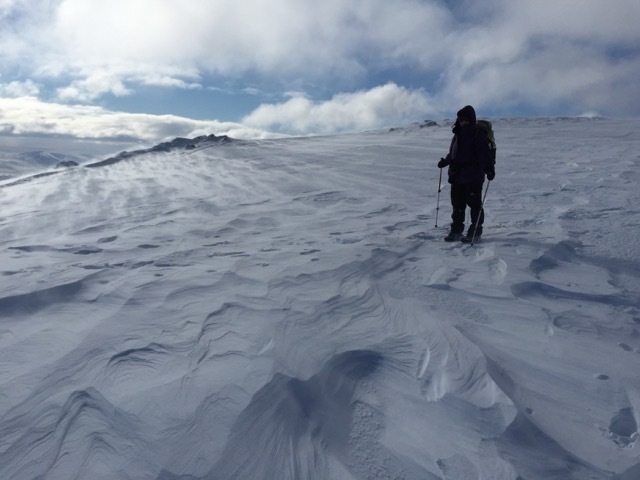 As we followed the broad ridge towards the summit, snow was blown across the slopes and at times stinging our faces. On the summit. It was bitterly cold in the wind so it was a case of a quick sandwich before heading for the shelter of the lower slopes. 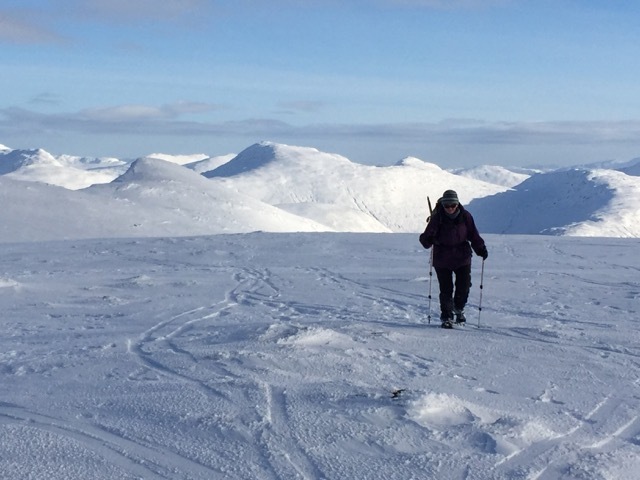 The last few weeks have seen some superb conditions in the Scottish mountains and we were fortunate enough to be able to take advantage of some of them. There are two mountains, which dominate the A82 above the Bridge of Orchy and are a familiar sight to those people who drive along this trunk road. 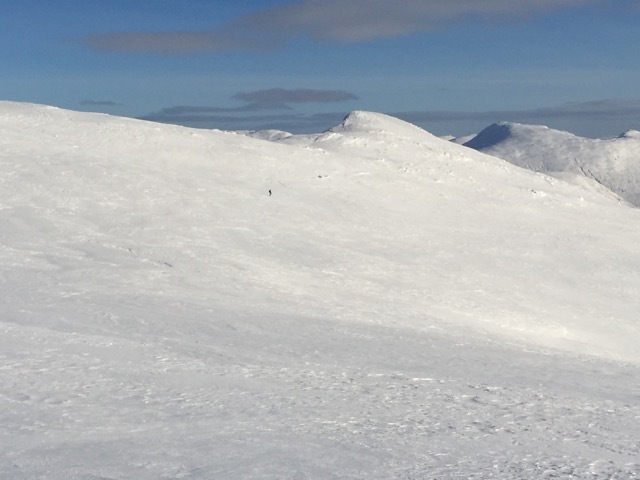 Beinn Dorain and Beinn an Dothaidh were selected as our target for the day. The forecast was perfect for a day in the mountains so it was a matter of packing the rucksacks and heading up. Conditions couldn’t have been much better. What followed was probably the best day I have ever spent in the mountains in the UK, at least I can’t remember any which were better. I suppose any day when you wear crampons for six hours has to be a good day. At the end of the day it seemed as if we were the last people off the hills, making full use of available daylight, before heading off for our celebratory pint. Leaving the Bridge of Orchy. Our route took us right from the col initially before dropping back down and heading up to the left. On the ridge towards the summit of Beinn Dorain. Views of distant summits were starting to appear. 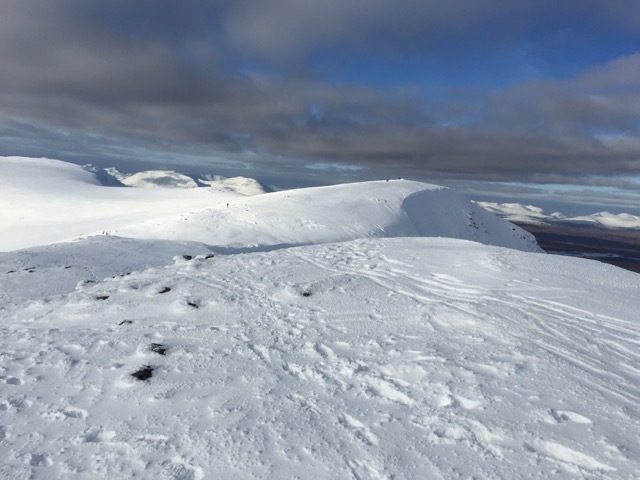 Looking along the summit ridge of Beinn an Dothaidh. At this point the wind had dropped completely. Nicky approaching one of the summits along the ridge. We left the summit just after 3.00, we were the only people remaining up apart from one other person heading down the snow slope. He is the black dot just below the ridge. Apart from him we had the mountain to ourselves. A summit photo taken by somebody who isn’t used to using an iPhone, judging by their finger in the bottom right hand corner.